Full-length collection of original poetry from Maryann Corbett, now available for order from Amazon. 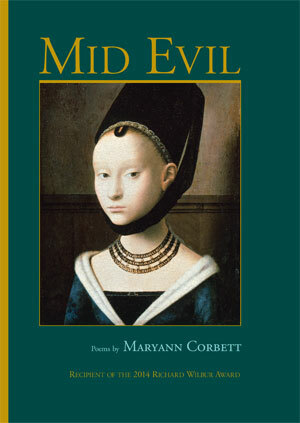 Mid Evil by Maryann Corbett, recipient of the 2014 Richard Wilbur Award, is a deeply profound yet uniquely accessible collection of exquisitely crafted poems, which are haunted by the past as it relates to our present-day lives. As poet Ned Balbo has written, "Corbett's poems are both historically attentive and absolutely up-to-date," and they deal not only with the poet's scholarly interests, but also consider, with great sensitivity and compassion, such issues as motherhood, gender, mortality, and the contemporary relationship between high and pop culture. This new collection of poems by Maryann Corbett will confirm what her fortunate readers already know: that she is a poet and translator of remarkable accomplishment, whose poems are “worldly” and “knowing” in the best senses of those words. They offer us the delights of their wisdom with an openhandedness for which the only possible response is gratitude. Suffused and haunted by history, the poems in Maryann Corbett’s wonderful new collection, Mid Evil, derive their beauty and power from their fidelity to what is true, in the poet’s life and in ours. Among the truths these impeccably crafted poems witness and affirm is the continuing presence of the past. There are transformations and transubstantiations in Mid Evil—Corbett is a deeply Catholic poet—but they are hard-won and provisional, never the products of smoke and mirrors. Readers accompanying Corbett on her journey into midlife, motherhood, mortality and medieval history will want to make frequent return visits. MARYANN CORBETT earned a doctorate in English from the University of Minnesota and expected to be teaching Beowulf and Chaucer, but instead has spent more than 30 years working for the Minnesota Legislature. She is the author of Credo for the Checkout Line in Winter (Able Muse Press, 2013) and Breath Control (David Robert Books, 2012) as well as the chapbooks Gardening in a Time of War (Pudding House) and Dissonance (Scienter Press). Her poems, essays, and translations have appeared in Barrow Street, Southwest Review, River Styx, Atlanta Review, Rattle, Subtropics, and many other journals and anthologies. Her poems have been finalists for Best of the Net, the Morton Marr Prize, and the Able Muse book prize, and have won the Lyric Memorial Award and the Willis Barnstone Translation Prize. She is ma rried to John Corbett, a teacher of statistics and mathematics, and they have two grown children.